Ever since I discovered the wonders that a simple black eyeliner can do for one's looks, I've never gone out on a night out without one. When I went to the US for a 6-month stay and with make-up fiends for friends, I was indoctrinated to wear make-up everyday. By their example and encouragement, I took the plunge...at the MAC cosmetics counter at Macy's. I was just supposed to find a new black eyeliner pencil (of course!) but the friendly make-up artist behind the counter offered a free make-over. How can one resist such an offer? So, my purchase extended to three eye shadows (Orb, Brownstone, and Print), an eye shadow base, and an eye shadow brush (blend like a pro!). Then I started visiting Sephora and discovered the magic of highlighters...and other fantabulous make-up brands that I never knew existed (Benefit, Bare Escentuals, etc). Thus, began my love affair with rogues and paints. Joining The Body Shop many years down the line from that US trip has intensified my love for make-up. I just take five steps from my desk to the Training Department's area and get made up by a pro! Or, if I'm out in the mall, I just pop into one of our stores and the make-up artist in residence will take the reins. Plus, employees got additional discount so buying quality make-up -- brushes, basics, and limited editions -- was made easy. Now that I know the rudiments of basic make-up application (or so I think), I wanted to level up by learning how to put it on like a pro...and be more creative and adventurous in my colors and make-up style. Later on, I want to be the go-to person of family and friends for their make-up needs during special occasions. Then, maybe earn on the side as well. I've decided to check myself into a class to see if I've got my basics right. So, I enrolled at the Personal Make-Up Application workshop offered by CAS (Center for Aesthetic Studies) last May 22. Every workshop has a make-up sponsor. And, for that day, as fate would have it, it was MAC (As make-up sponsor, all products to be used in the workshop will be provided by MAC). The lecturer was Ms. Mari Wild who was trained in the UK. She was really funky. And her lipstick application of MAC's Russian Red was flawless. She imparted a lot of easy-to-follow make-up tips and tricks. However, given that the workshop will only run for 4 hours, the hands-on make-up application felt rushed. We were a relatively small class of 11 students. But with only 2 instructors on hand -- Mari and Owen Sarmiento from MAC -- there was not just enough time to guide everyone on the step-by-step process of make-up application. Since some of my classmates had no personal make-up application experience, I felt that they would need more the solid guidance than I do. Thus, I would apply my make-up one-by-one and have them check my technique. Seems to be that I'm on par with everything except for the blush (I don't put enough. It should still be visible even when you're 5 feet away.) and my eye-lining (Don't go way into the outer corner of the eyes or it'll create an impression of a messy application.). I also have decent eye-shadow application technique but needed a better brush for flawless application (I was not using the MAC eye shadow brush for this workshop) and put more contrast to my color choices. Otherwise, I was good to go. It was a good workshop although it fell a bit short of my expectations. I was expecting a really thorough step-by-step application demo. But maybe its not possible given that we had to squeeze in a lecture and hands-on application in just 4 hours. I was also expecting more techniques. I already knew most of the items that were discussed so I was really itching that we move along. Having been a solid make-up user for so many years now and working for The Body Shop has elevated my knowledge and technique. Since this workshop catered to those who have no or little experience with make-up, I was, most likely, "overqualified" for this and would probably be more challenged in an intermediate / advanced course. 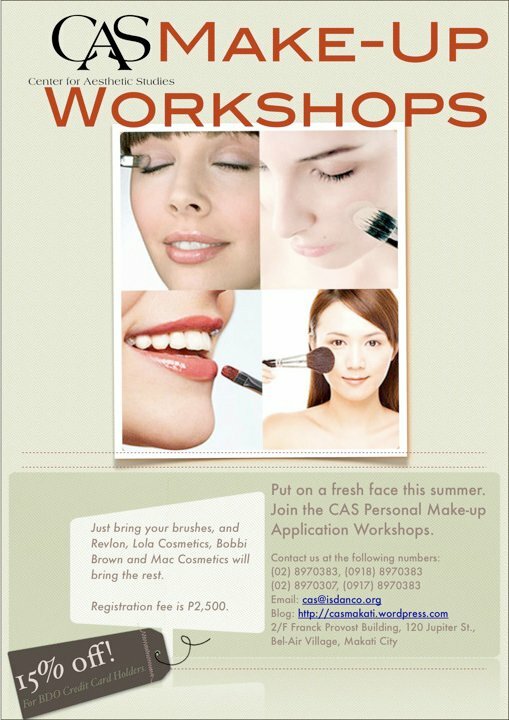 Now that I know how a make-up class / workshop goes, I'd really like to enroll in a make-up course. I have yet to determine if CAS is the make-up school for me. There are still other make-up schools out there so I guess I'll drop by in those one of these days and find out. In the meantime, happy graduation from the beginner level for me!